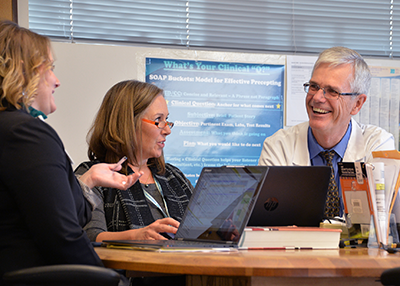 Welcome to the Montana Family Medicine Residency, Montana’s first residency training program. MFMR was founded to address the shortage of family physicians in rural areas and among underserved populations. We’re proud to have nearly 60 percent of our graduates still practicing in Montana. Our location in Billings, Montana’s largest city, means our two hospitals provide specialty care to an area larger than the entire northeastern United States. Hospital specialists interact daily with providers in rural communities, and know the experiences residents need to practice in medically austere environments. Our Wilderness Medicine Fellowship through the Wilderness Medicine Academy offers an additional skill set many graduates have used in medical missions, expeditions, and trauma care. MFMR was one of the first residencies structured within a Community Health Center, and one of the first 11 Teaching Health Centers. Practicing in a Community Health Center has several advantages. Residents learn to care for high-needs patients who have limited resources and limited access to care. They learn to treat patients in the full spectrum of their illness and social milieu while using resources wisely. In 2017, the residency received the DeWitt C. Baldwin Jr. Award, one of three programs recognized nationally for humanism in resident education. As a National Committee for Quality Assurance recognized Patient-Centered Medical Home, behavioral health consultants, care managers and pharmacists are integrated into clinical care teams, helping residents understand the options and resources necessary to surmount obstacles to care. We prepare our graduates to be comfortable with a wide range of practice choices from rural and frontier communities to underserved populations and hospital settings. Many of our residents are drawn to Billings by its proximity to great outdoor adventures—from fishing in pristine trout streams to climbing the state’s highest peaks, to mountain biking, skiing or wilderness camping. Billings’ stable economy offers employment opportunities for spouses, good public and private schools, two colleges and vibrant entertainment venues. Housing is affordable, enabling many residents to purchase their first homes here. As the gateway to all that practicing medicine in Montana offers, we invite you to come take a look. Welcome to Montana’s first medical residency!